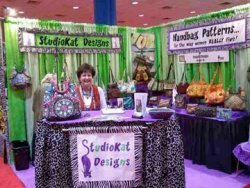 AUGUST 2011 - Kathy “Kat” Southern started StudioKat Designs seven years ago but kept her day job with the city for another 18 months until eventually “retiring” with 29 years of government service and 4 patterns on the market. She now has 22 handbag patterns and 2 purse insert patterns. Originally from Connecticut, Kat spends most days at home in Winston-Salem, N.C. designing, writing her newsletter, blogging, packing patterns, handling correspondence, etc. Because her studio is in her home, she finds it difficult to NOT work. She relaxes by traveling with her husband. and specially loves collegiate sports and visiting her grandson in Charlotte. And as if she wasn’t doing enough, she plays the clarinet in her church orchestra. Presently, she’s in the process of finishing a new pattern for fall and chronicling the process on her blog. StudioKat is venturing into the notions business with the addition of two items to their product line; a brand new invisible sew-in magnetic snap perfect for handbags and black & white striped zippers in six different sizes. They will be ready for release in September. Kat doesn’t play favorites with her family of bags, “ My favorite bag is pretty much always the one I am working on right now.” Why not visit Kat and her bags at studiokatdesigns.com or her blog studiokatdesigns.blogspot.com. and on Facebook - StudioKatDesigns and Twitter- StudioKat.